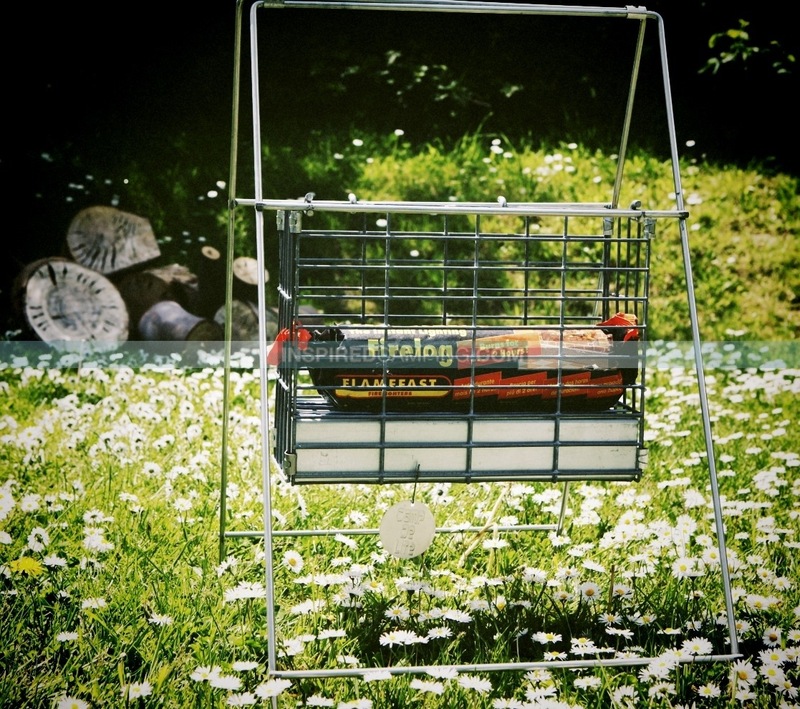 Do you have an idea for a product you think campers will love at their campsite? Have you been desperate to launch it but just don’t know where to start? Well Andy from Camp De Lite would like to tell you his story in the hope it may help you with your own. Andy has recently launched his own innovative product that allows campers to build a campfire off the ground. It is the type of product ideal for campsites that don’t wish to provide campfire spaces because of the damage it can cause to the ground, but also don’t want to remove this pleasure from their customers either. 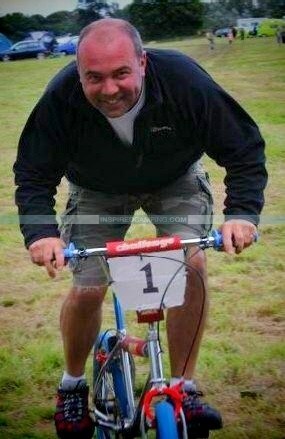 So here’s Andy to share his story and how Camp de Lite started. Mine is a simple story but one that may strike a chord with many reading this article. The story is basically about having an idea and then following it through to a commercial proposition. I guess many of us have had good ideas and that’s just how they stay. Well I wanted my idea to be more than just a concept. My inspiration, if you like, was that when I was a young boy my father had an idea of a product. He couldn’t shake off the possibility that the idea may have some commercial value and in some respects he may have just needed to get the idea out of his system and turn it into a physical entity. As I remember he actually won a nice carriage clock for his inventiveness and innovation and other than having his product installed around our house and his mothers, that is as far it went. When I was at school I had a couple of entrepreneurial enterprises decorating and painting school bags with album covers and also mimicking leather leaf tags of a well know brand of shoes at the time. My professional background is in manufacturing and product development and most latterly in sales, but my early entrepreneurial days have helped fire my ambitions. I have always been a keen camper and love the outdoors. My family holidays from my late teens and early twenties to the present day were always spent heading off somewhere as a group of friends to remote sites and festivals. In cars, on motorbikes, even in the back of the mandatory transit van… I’ve done it all! With Camp de Lite I only ever wanted to sell one of them to a complete stranger. That’s it, just one to someone who ‘got it’ – the ideas behind the product, its features and benefits. I wasn’t choosey who that one person was, just that someone somewhere agreed with me and bought into it and could see the enjoyment it could give at the campsite. Family and friends of course don’t count as you can never really be sure if there’s a sympathy vote in there somewhere! However, at the time of writing this article the original sales target has been smashed by a factor of twenty. There are three of us in our family… Annie, Joe and me. A long time ago we were given garden candles in the form of a bamboo stem and holder with a tin can in the end with a cotton wick fuelled by lamp oil. Needless to say the bamboo lasted one weekend and needed to be replaced, but the principle was good and the light provided by the candle was really nice. The bamboo was replaced with plumber’s waste pipe from B&Q and the can was held in place with insulating tape. Job done, and we ended up having a total of 4 candles. The fuel is easy to come by but packing the candles away and decanting the oil back to the bottle is a messy job. Last August we decided to go to a VW camper van festival just outside Warrington at Arley Hall. A lovely location and small friendly festival type atmosphere. We found a good level site close to friends and far enough away from the main festival site… great. We pitched up and settled in. On the first night we saw a guy and his family arrive. They came in a big white van that could carry loads of gear. Early that evening he continued to unload their stuff and out came a full size fire pit, complete with a huge pile of timber to burn and have more of a bonfire than camp fire. I watched in envy as I’d forgotten to pack the lamp oil candles. Over to our right was another camper who was quite happily sipping beer next to his one and only wax candle. I was even jealous of his efforts having no fire effect of our own. I said to Joe that there had to be a middle ground. Somewhere between the guy with the van and the guy with the candle but as we were in the grounds of Arley Hall, a grand Stately Home, I’m sure they wouldn’t take to kindly leaving black scorch marks on the grass. I remembered the fire logs we had been using at a friends house in their chimnea and voila! 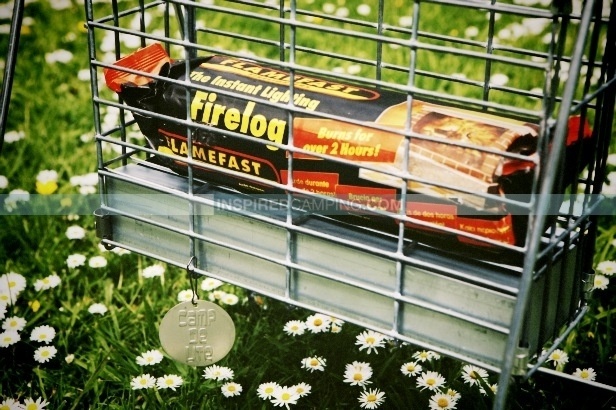 I realised if we could elevate the fire log safely from the ground that would be ideal for that type of camping situation. The following day I went to the local town and bought some fire logs and a disposable barbeque. I put the barbeque on an upside-down pan with the fire log on top of that and we had our campfire! It was so warm and inviting at the campsite our friends started to congregate outside our tent. However, it was a little unsafe in terms of stability so I decided I needed to develop the idea some more. The three of us talked it through and agreed that the idea was worth investing a couple of hundred pounds in and seeing if we could develop the idea into a commercial proposition. There needed to be clear benefits though, and it particularly needed to be elevated from the campsite ground so it didn’t scorch or burn the grass. We also agreed the camp fire cannot get too big so the fire basket needed the capacity of two logs only, and we wanted the key unique feature of it being easily assembled and packed away flat for storage with no fixings. It should also have an integrated ash pan so there’s no contamination of the campsite ground. We also wanted there to be no need to maintain the fire once it’s lit and it should make the most of fire logs which have a known burn duration and are relatively clean fuel. But most of all we wanted the over all effect to be just like a real campfire for large group of friends to enjoy. I saw a kitchen cupboard tidy basket, the type you hang on the inside of the cupboard door, and a fire log fitted it perfectly. Back home I then broke up an old camping table and suspended it from that. I used a hanging basket chain to suspend an old cooking tray under the basket, as this would provide further protection for site cleanliness as an integrated ash pan. With the prototype done I realised that in principle there was no reason why the idea wouldn’t work. So I decided to try to industrialise it. A short Internet search found a factory whose main core activity was as a wire former. Perfect! They made a couple of developments to the prototype and helped me develop the product into what it is now. Interestingly not all companies will help out with developing prototypes as they are set up for huge volumes and see this type of work as an irritation to their daily operations. Luckily one local business had the open mindedness to welcome being involved with my project. I placed my first orders for a small batch with a hope of selling via Ebay. Now the challenge of marketing had to be tackled. There were three immediate problems I had to face… setting up a website, email and social media strategy. I chose Twitter and Facebook, designed my website and set up the email. I soon learned the etiquette of trying to introduce a product through social media, and realised that the hard sell was definitely not appreciated. However being super gracious and helpful to others was my approach and in the main everyone was really good and gave me a lot of encouragement. In fact I had very few negative comments about the product, which was a great start. It didn’t take long to find out who was part of the outdoor social networking fraternity and who was influential, so I decided to send free Camp de Lites to them in the hope for their comments. This worked well and comes highly recommended. My first sale came from Ebay after contacting a Club via their online forum. They are very happy with Camp de Lite and I am told to expect further orders from their membership. I paid Joe £20 to cut and paste the email addresses of campsites that allowed camp fires and sent them an email politely asking for their comments and remarks. One of the respondents was a relatively local campsite that didn’t allow campfires. I have now delivered my first bulk order to them and Camp de Lite is the only camp fire format allowed on their site. They also plan to use them as “markers” as you drive into the site, lighting the way for people and traffic. Camp de Lite is available for hire or sale and they are increasingly sold through the sale of the fire logs themselves. During the development of Camp de Lite friends and family have been really supportive and I have taken on-board suggestions and built them into the product. You won’t be able to tell, but I know exactly where my mums’ suggestion is and where my dads’ suggestion is, and I’ve made a point of developing them into the final product. I am also immensely proud that Camp de Lite is made in the UK, packaged in the UK, and we have no plans to change. The design is now registered at the Intellectual Property Office and I am talking to a couple of retail outlets about stocking them. However, my feet are firmly on the ground as I know there are no guarantees and many hurdles to overcome. I also never forget that while sales targets might be great, not all costs have been covered yet. The name Camp de Lite is just my cheesy play on words and doesn’t pretend to be anything more. Overall we are definitely having great fun with our product and as part of the branding we provide a Camp de Lite ‘dangler’ and you are encouraged to dangle your “dangler” from anywhere you like! Our strap line is: “The best way to leave your mark on the earth is to leave no mark at all” which we think fits the product really well. So come and see what we’re all about at Camp de Lite or join us on Twitter or Facebook. We’d also love to hear from you if you’ve had a similar experience to ours, so please feel free to email us at sales@campdelite.com. I’m sure we’re not alone and maybe reading this has given you that little push to make your first move, even if that first move is to get in contact with us. So have you ever had an idea about a product that you strongly believed in? Use the comments section below to fill us in… we’d all love to hear from you.